Shuttle Atlantis rises over Launch Complex 39A at Cape Canaveral, Fla. This was the view from the banks of the Indian River in Titusville, about 15 miles away. As you can see, Atlantis is rotating so that the external fuel tank soon would obstruct our view. 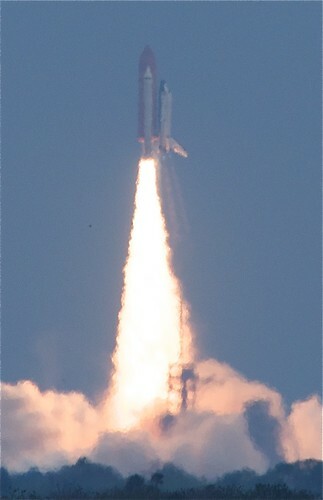 Left: A cropped-in vertical version just after liftoff of Atlantis. The heat of the engines and the haze in the atmosphere causes a blurry effect in the plumes. 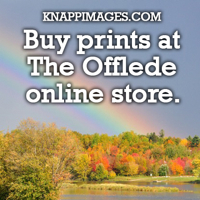 This post marks the end of a simultaneously frustrating and ultimately gratifying day of photography. Considering the night editor I am, it started earlier than usual: 7 a.m. 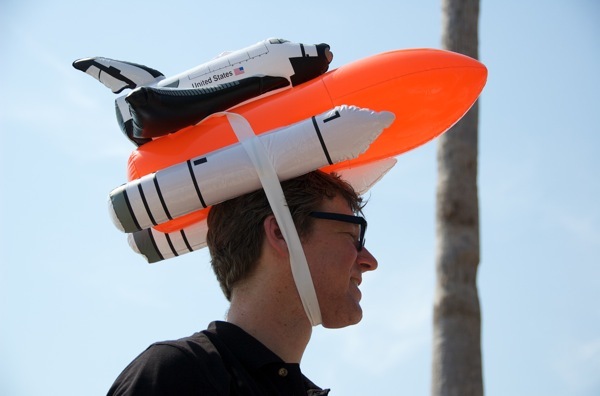 I wanted to arrive at Titusville's Space View Park about five hours before the launch of shuttle Atlantis at 2:01 p.m. Monday. It was the first day of my 20 months in Florida that I had to dedicate solely to photographing a shuttle. I wanted a clear view from the banks of the Indian River of launch pad 39A. Not to my surprise, a lot of other people had the same idea. 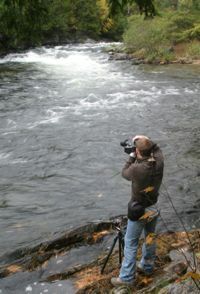 But I found a spot about 9:30 a.m. where I was able to set up my video camera and new Nikon D90 still camera. It had an unobstructed view of the launch pad, about 15 miles away, with piers in the foreground. In addition to the view, the good things about Space View Park is that the Mission Control radio feed is blasted over loudspeakers. There also were iconic Hubble Space Telescope photos available for free and burgers and dogs available for a small price. Orlando media tend to broadcast live from the site, too. 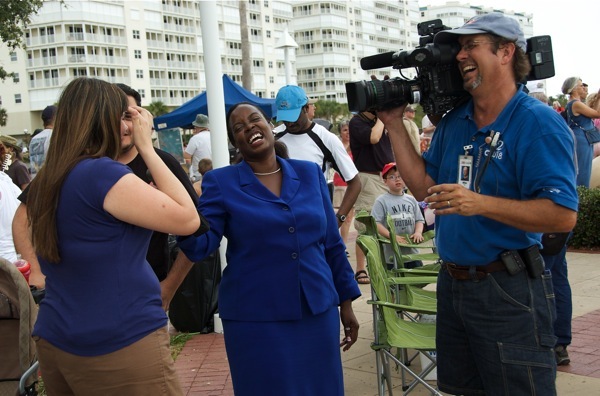 A crew from WESH 2, the Orlando NBC affiliate, interviews a couple of spectators. I set up and waited. With a former co-worker of mine, I sat with sweat dripping off my hat and through my jeans and longsleeve shirt. The temperature was 91, unseasonably warm for May. 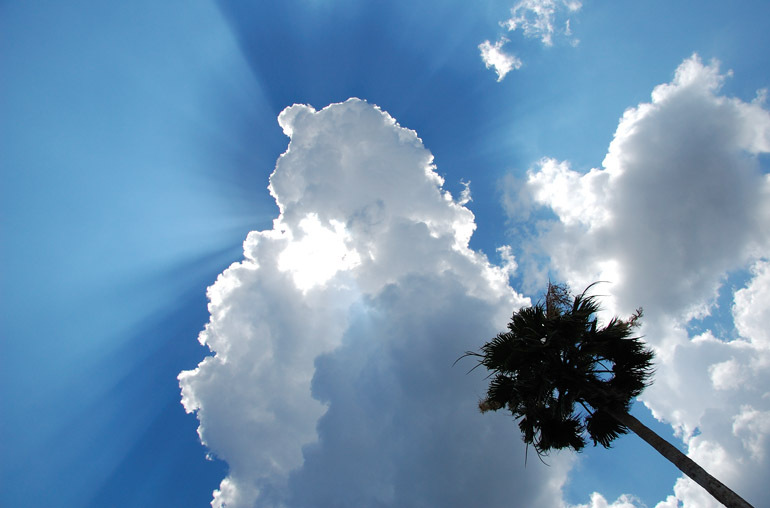 Not even SPF 2000 - to protect all my 2,000 parts - is effective on my skin. The full complement of clothing, though, successfully blocked the sun. The benefit of having a partner photographer was that I was able to take a break, grab a cooling milkshake at the nearby Burger King and not fear that somebody was making off with my expensive picture-taking equipment. What couldn't be prevented, however, were the latecomers who thought they deserved to set up their chairs, umbrellas and full-size coolers in front of us. To them, I say: For one thing, you need to come early to get a spot like the one we had. For the next thing, you'll be waiting for an hour - an hour. Why do you need a cooler full of ice, sandwiches and pre-popped popcorn. Like many spectators at Space View Park, this shuttle fan spoke with a strong English accent. Many countries were represented. But it is nice to know that the space program, despite the decreasing hype over the years, still draws a diverse crowd. There were families from London, Scotland and Melbourne, Australia - a lot of representatives from other English-speaking lands. They are welcomed warmly. (The losers who set up in front of us, though? Not so much.) I talked for a while to a man from northern England, who was sitting next to me. We commiserated over the state of our industries: he in the automotive sector; I, of course, in newspapers. Being from England, he wasn't used to such heat, though he said he often vacations in Florida and is thinking about retiring here. Pretty clouds arrive on the scene in Titusville. Oddly enough, this turned out to be one of my favorite photos of the day. While the weather was irritating for the long-haul spectators, it was good for NASA. 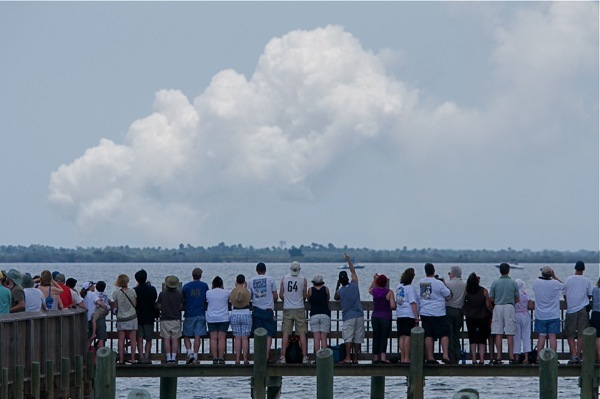 But as the launch time neared, clouds started to move in over Kennedy Space Center. They provided relief for launch watchers, but they weren't as welcomed when Atlantis roared to life. Contrary to what I had been told and what I had read, the shuttle shot straight up. It makes sense, too, because its course was due east from KSC, but I thought Atlantis was to arc from left to right, taking it into the rare orbit of the Hubble Space Telescope. But my sources were wrong, resulting in the video I took featuring the shuttle only in the left one-third of the frame. I'll post that later. 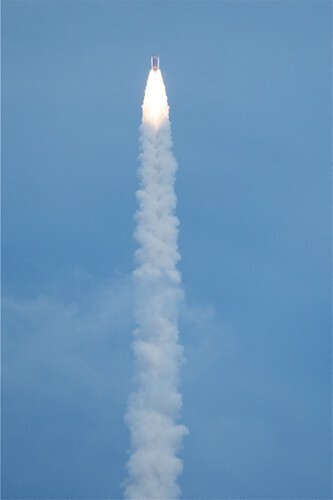 The profile of Atlantis was visible at liftoff. Soon after, though, the shuttle rolled, and the spaceship's external fuel tank blocked our view. And the clouds had set in so thickly that the best sight was immediately after liftoff. Atlantis weaved in and out of the clouds for a minute, then disappeared. One of the best parts of the launch, the separation of the solid rocket boosters, wasn't visible. 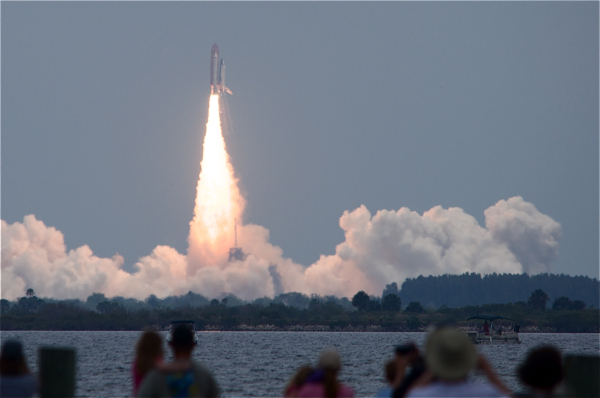 The first launch I ever saw on the Space Coast - of shuttle Discovery, which I watched lift off from outside my apartment in Cocoa Beach - had the best weather I have seen thus far. View that image here. Despite a degree of disappointment, the early trip to Titusville was worth it. I got to hang out with not one, but two laid-off copy editors and talk with people from foreign lands. 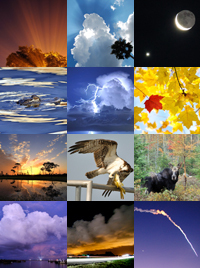 I distributed my business card to people who admired my large 150-500mm Sigma lens. Some said they weren't able to get good photos, so they wanted me to hook them up. And though the haze made the photos less than spectacular, they were my lens' best effort. 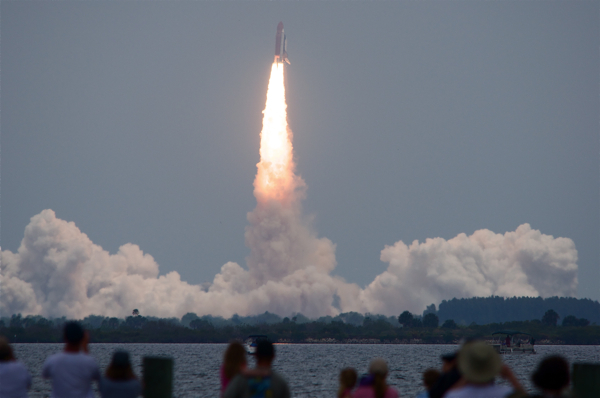 Once again, though, NASA put on a spectacular show with the start of STS-125. I waited more than four hours for something that lasted less than four minutes. But a shuttle launch truly is one of the most awesome sights a human being can experience. John Kelly, FLORIDA TODAY's local editor and space columnist, conveys that eloquently in his Monday piece. I can't wait for the next launch. A spectator points upward toward the rising shuttle, which was mostly out of view at this point. The cloud in the background is from the launch.